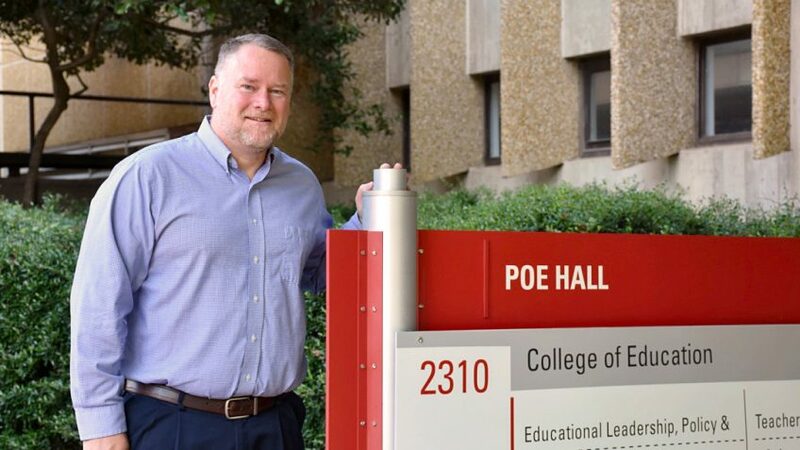 Professor Kevin Oliver has been teaching at NC State’s College of Education (CED) since 2005. He teaches online graduate-level courses in the Master of Digital Learning and Teaching program as well as the Doctoral Learning Design and Technology program. Before coming to NC State, Oliver attended the University of Tennessee, where he played the trumpet in the marching band from 1986 to 1990 and earned his bachelor’s degree in communications. “I think it’s interesting that you meet a lot of people in my educational technology field with a background in music. There seems to be some connection there,” Oliver said. In addition to the trumpet, Oliver plays the piano and hammered dulcimer, a percussion and stringed instrument. Oliver earned his Master of Education in Media and Instructional Design from the University of North Carolina at Chapel Hill in 1993, and earned his Ph.D. in instructional technology from the University of Georgia in 1999. Now, Oliver teaches ECI 513: Teaching and Learning with Digital Video, ECI 515: Online Collaborations in Education, ECI 721: Technology and Informal Learning Environments and ECI 722: Theory and Research in Distance Education at NC State. Oliver enjoys teaching and really enjoys creating online courses and designing new learning experiences for online and distance education students. In addition to growing the program, Oliver has also enjoyed growing his international work made possible by three grants he received from the Triangle Community Foundation‘s Borchardt Fund. The fund offers international professional development opportunities in England, Finland and Sweden for more than 80 North Carolina in-service teachers. One thing Oliver looks forward to is hearing about other colleagues and teachers who are using some of his methods and techniques in their own classrooms. “It’s nice to hear that the strategies introduced in your course are making a difference in K-12 schools,” Oliver said. According to Oliver, students who wait until the last minute to complete their coursework tend to struggle the most. “Time invested and commitment really shows when projects are turned in,” Oliver said. Students interested in the Master of Digital Learning and Teaching program or the Doctoral Learning Design and Technology program should contact Michael Evans at michael.a.evans@ncsu.edu.